An FR-S already comes standard with dual-exhaust and side-vents, but adding a full body kit would really turn heads as you’re driving down the street. You can go with the full body kit right out of the gate, or you can piece it together to give your car that truly custom look. You could add the carbon fiber hood for some intense personality. For the front end of the car, you could add on a front bumper and for an added touch, add on the body kit front bumper lip, possibly one like this one from Duraflex. 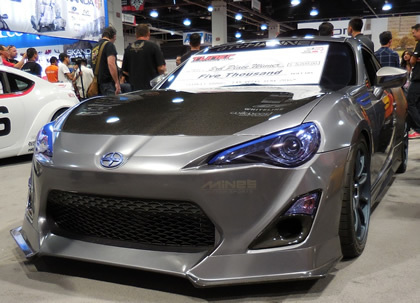 Go on to add side skirts, back bumper and a hatch to finish out your modification.ld add your own body kit to your Scion FR-S. At the SEMA Trade Show 2014, we saw a Scion FR-S that had a body kit added and we thought it looked fantastic. We wanted to share a few tips on upgrades you could add to your Scion FR-S to customize it the way you want. Express Aero Kits can offer the help you need to get you started. We’re based in Huntington Beach, California, but serve any who want the best in modification parts. Start to see the reality of your dream Scion come together as you shop our site.